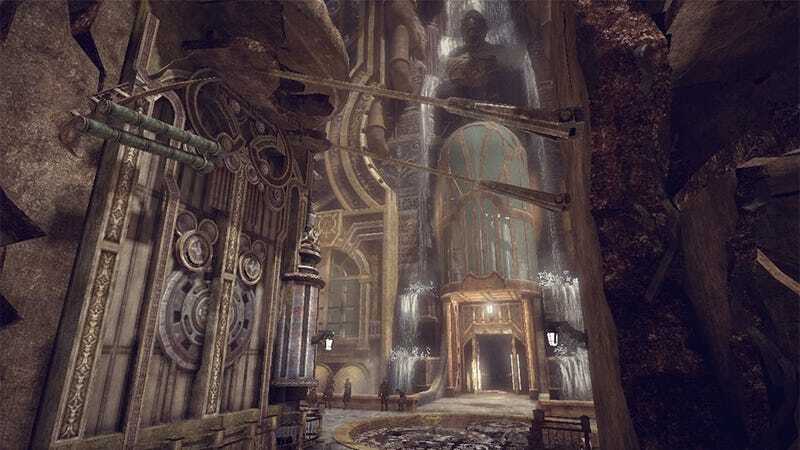 I've been following the development of Fuzzyeyes Planescape-esque steampunk adventure Edge of Twilight since 2007's first teasing glimpse of a world that seemed torn from the pages of one Dungeons & Dragons' most underrated settings. In 2009 there were rumors that the entire project had been scrapped, and development slipped into limbo. Then, in December of 2012, Edge of Twilight lurched to life once more, the rejuvenated console project due out this summer (the screen above is from that), and a pair of iOS games due out incredibly soon. Maybe I only thought I was following Edge of Twilight. Maybe it was following me. The mobile push for the series begins tomorrow, with the release of the free Edge of Twilight: Horizon app. Horizon's purpose is to introduce players to certain aspects of the game universe—setting, history and such. Its true purpose is to pave the way for Edge of Twilight: Athyr Above, the full iOS game slated for release on March 28. Considered the first canon installment of the series, Athyr Above is an action combat game with role-playing elements. Players will switch between day and night to solve puzzles with Lex, a character with different abilities and forms based on which side of twilight he occupies. Lex's combat abilities will be determined by how and where the player invests in the game's deep skill tree. The free Edge of Twilight: Horizon will feature a countdown to the release of Athyr Above, as well as exclusive information on the upcoming console release. There was a time I mourned Edge of Twilight as a lost thing. So much new activity and energy does my heart good.